It’s no secret that the kitchen is considered the ‘heart of the home”. Not only is it the place to cook and eat meals but it’s also a place where families like to gather to sit around for conversations, fun, and entertainment and so much more. Does your family like to congregate in the kitchen for so many of these reasons or just because? to work faster and get more done. find kitchen things when I need them. 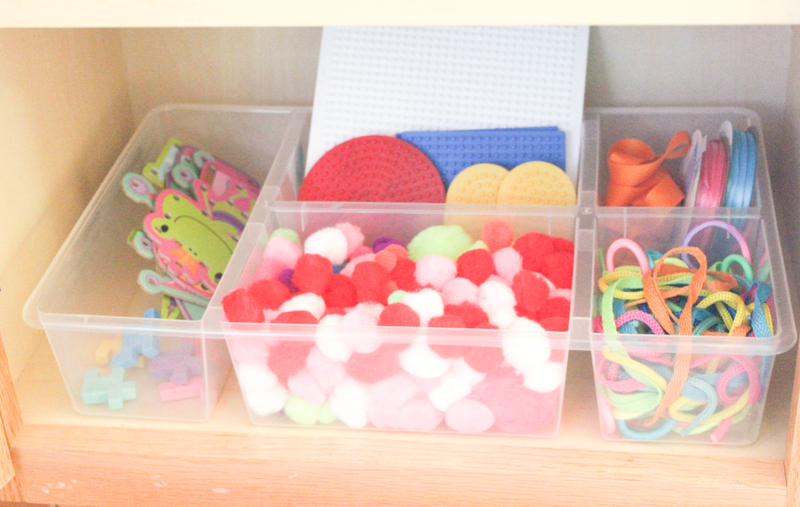 keeps things neatly and orderly. 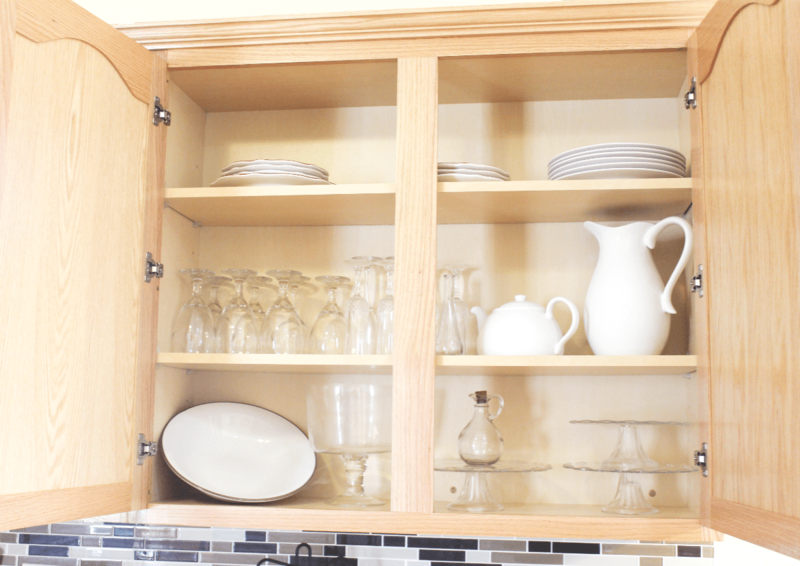 Whether your kitchen is large or small, it can be organized in such a way to make things functional so you can actually enjoy using the kitchen. In our previous home, our kitchen was super tiny but I was determined to have it organized. And it was. 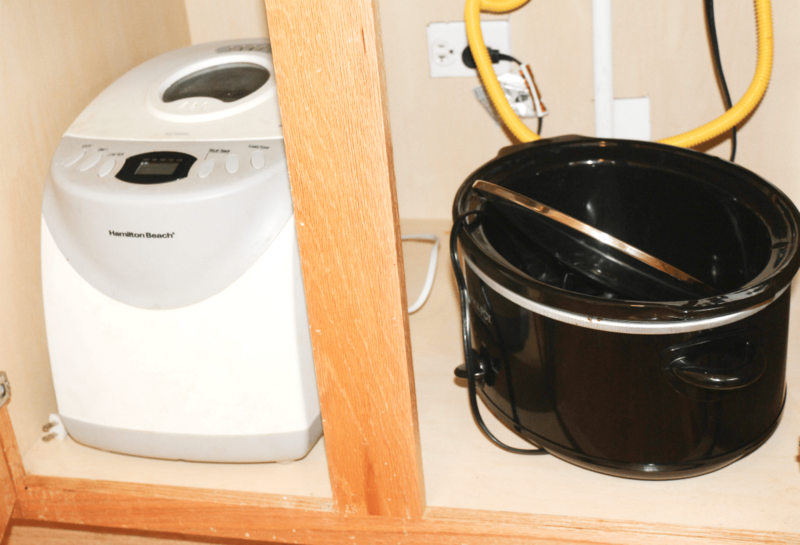 In fact, I was able to keep big appliances off the counter to avoid clutter and to create more space for prepping food. (I have tried to take photos of that kitchen but it just did not give off the best lighting). 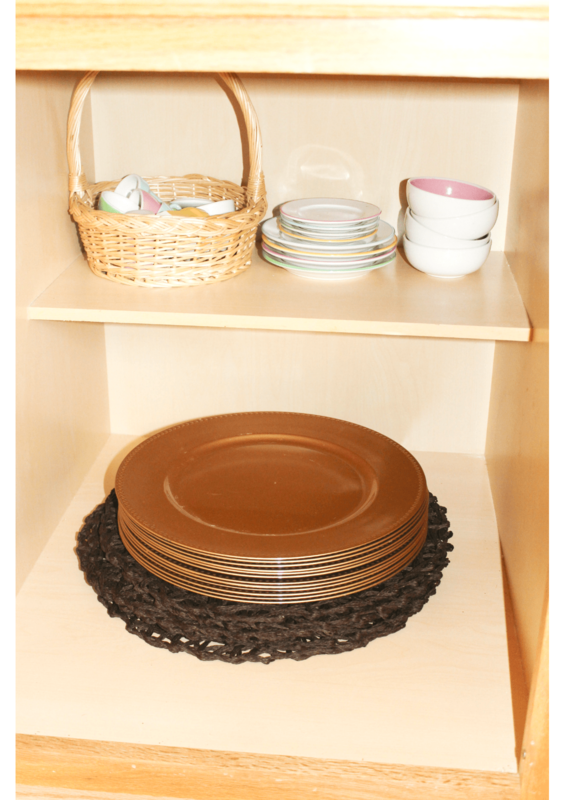 You’ve already seen how I organized the pantry. Can I add that it has been working really well? 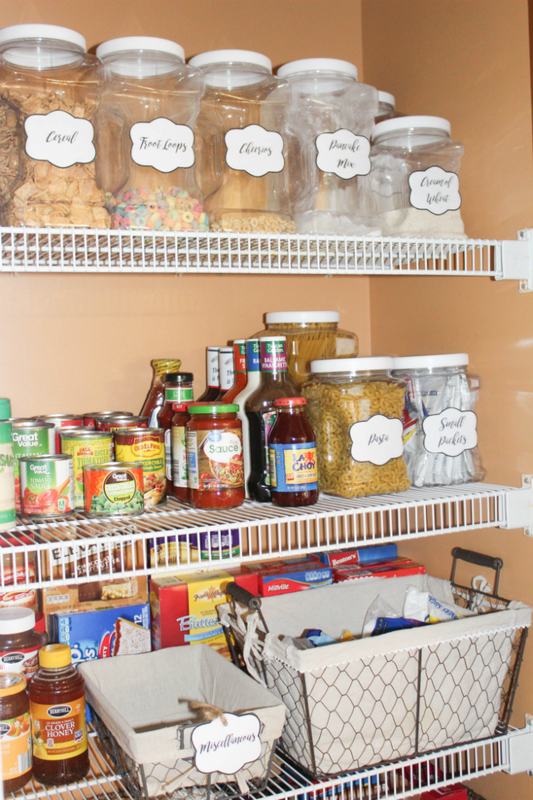 Catch the three steps to an organized pantry post here. And by the way, if you need some pretty labels to help you organize pantry food, you are welcome to download these free ones here. 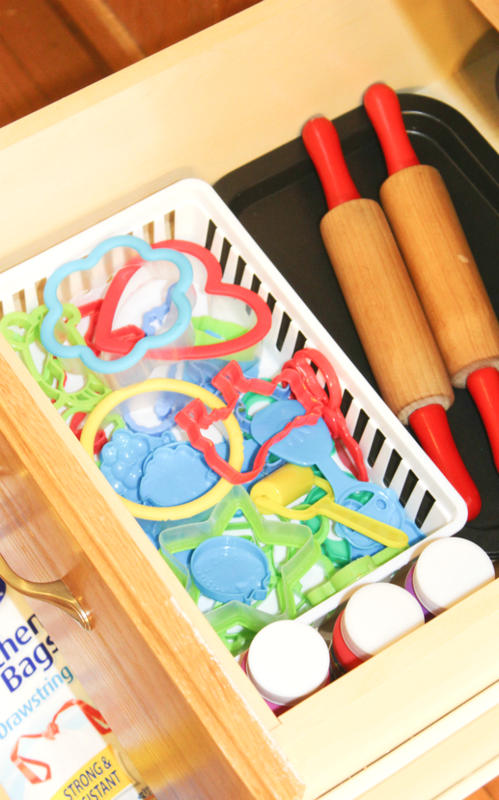 Using trays, small baskets, and drawer organizers to corral items. 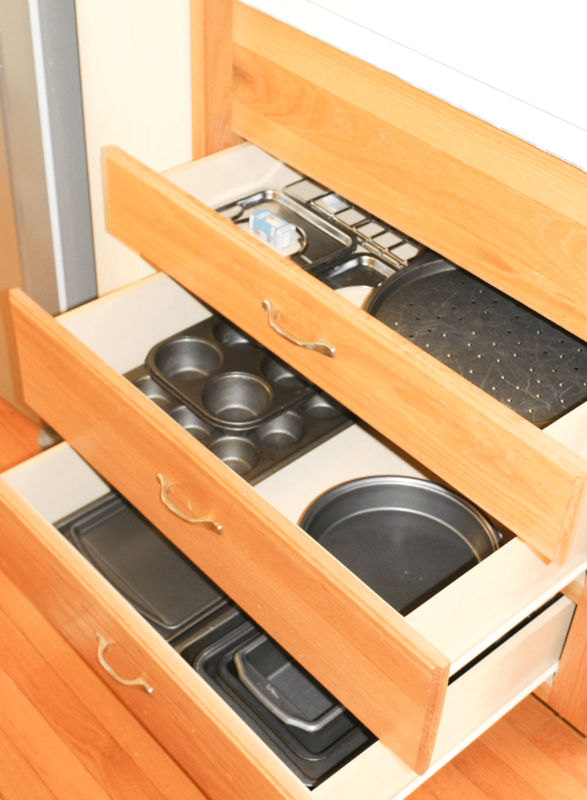 The drawers will have more space and they will look nicer too. 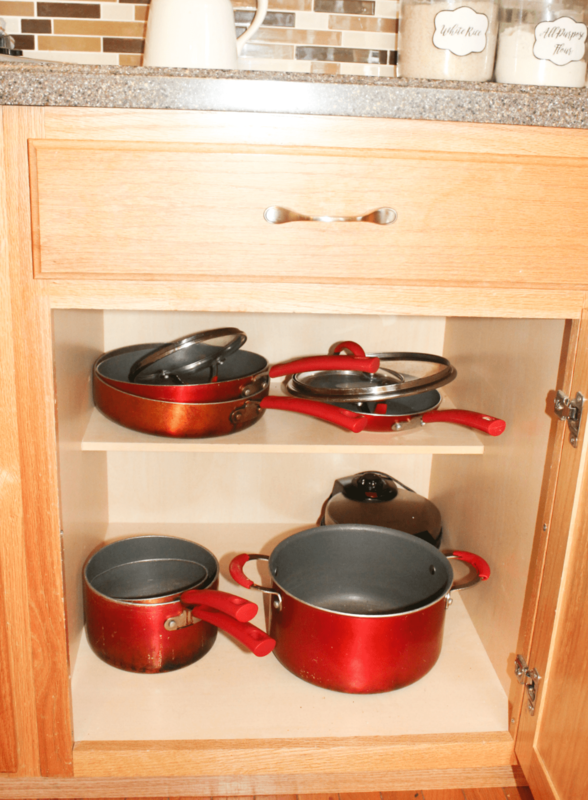 Organizing all items by type – all cookware together, all utensils together, all drinking cups together, etc. 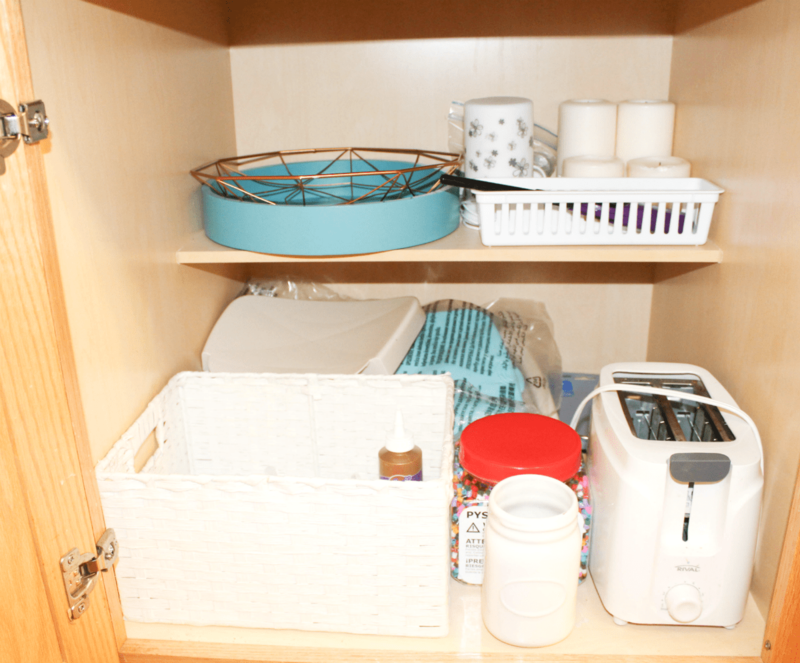 Organizing items next to their related appliances – putting cooking utensils and pots and pans next to the stove, keeping all bakeware next to the oven, coffee mugs next to the coffee maker, etc. 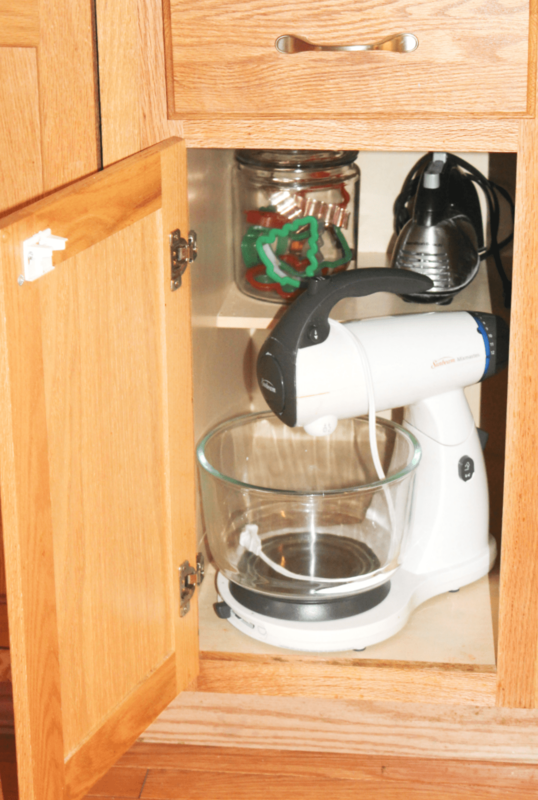 You’ll find it much easier, less time-consuming, and less frustrating than having to walk back and forth to retrieve stuff while you are in the kitchen. 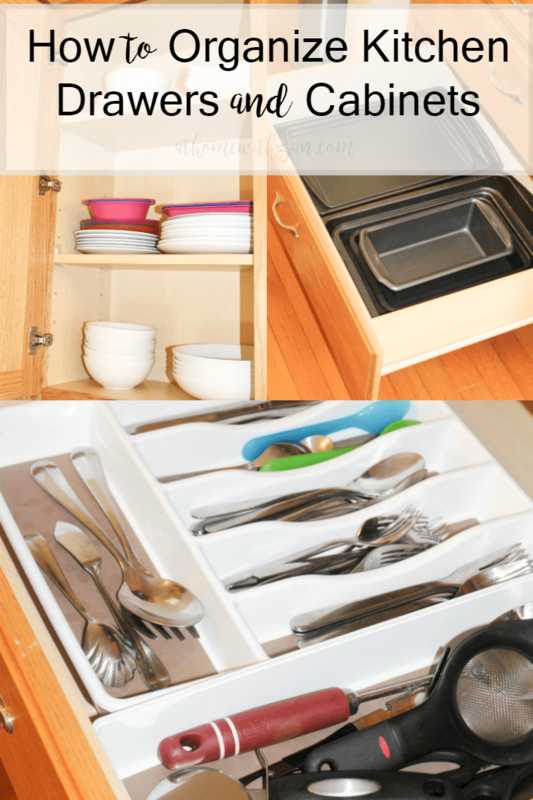 I’m giving you a peek of how I organize some of the drawers and cabinets in our kitchen. 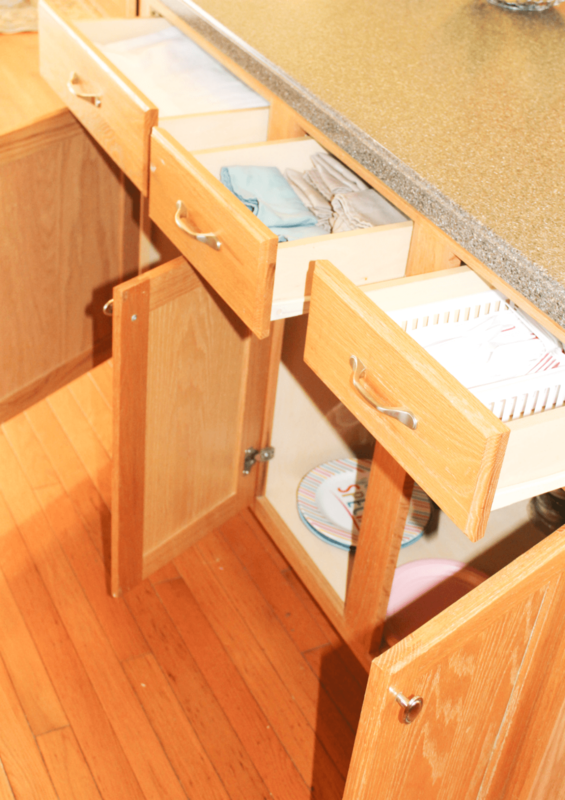 It’s a very large kitchen so we have a ton of cabinets that are still unused. But having it organized in a functional way, makes things so much better. You’ll probably realize that I have not taken much photos of the counter tops. It’s because most of the large appliances are in the cabinets. Actually, the only appliance I keep on the counter is the Keurig. I wonder why!! Note: Since I took these photos a few months ago, I’ve moved around some things, bought and added some other stuff like more colourful kids plates and bowls to the cupboards, more trays, along with a few other changes. 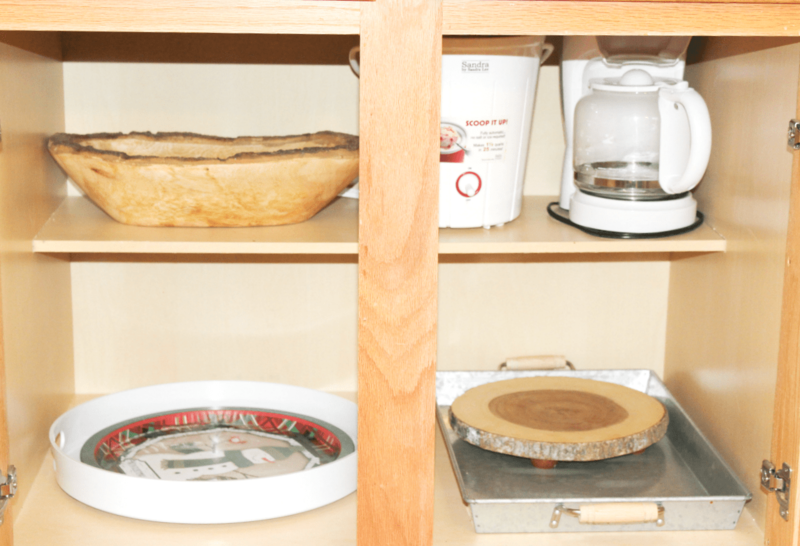 As far as larger food storage bowls, those came in after the photos. 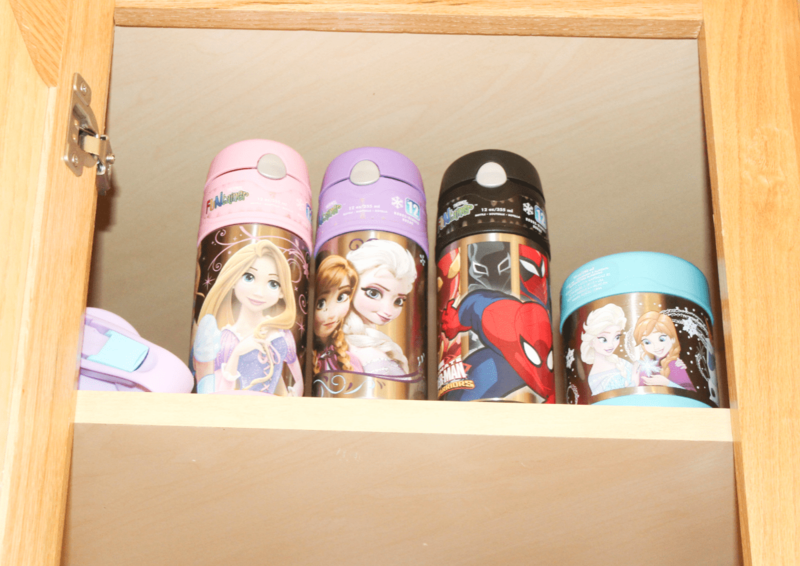 I’ve created a space in the mugs and cups cabinet and moved the kids hot/cold bottles (in this photo) to the other side. 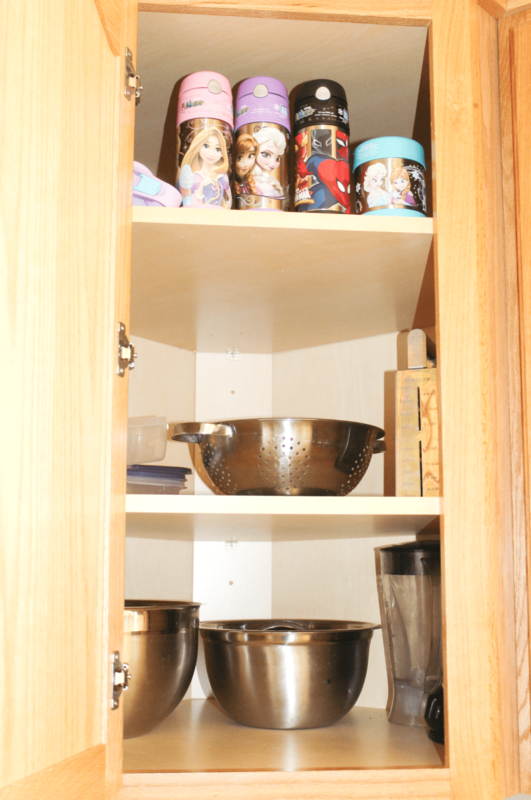 The colander has taken their spot on the top shelf and the bigger storage bowls are kept on the middle shelf. 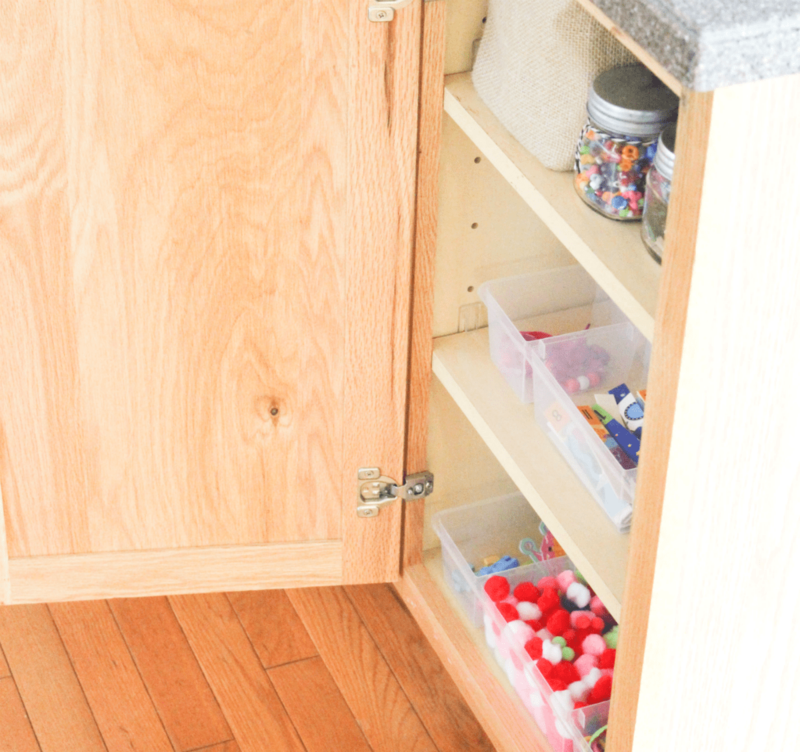 I’ve also moved the kids craft things to the playroom so those cabinets are now currently empty, too. But the overall organization system, for the most part, is pretty much the same setup. This drawer is right next to the pantry. All these dried snacks were for on the go – crackers, pretzels, veggie sticks, and cheerios. We love to eat fruit and raw veggies (A LOT) but there is always that time when we ran out of and need something to take with us on a quick outing or so. 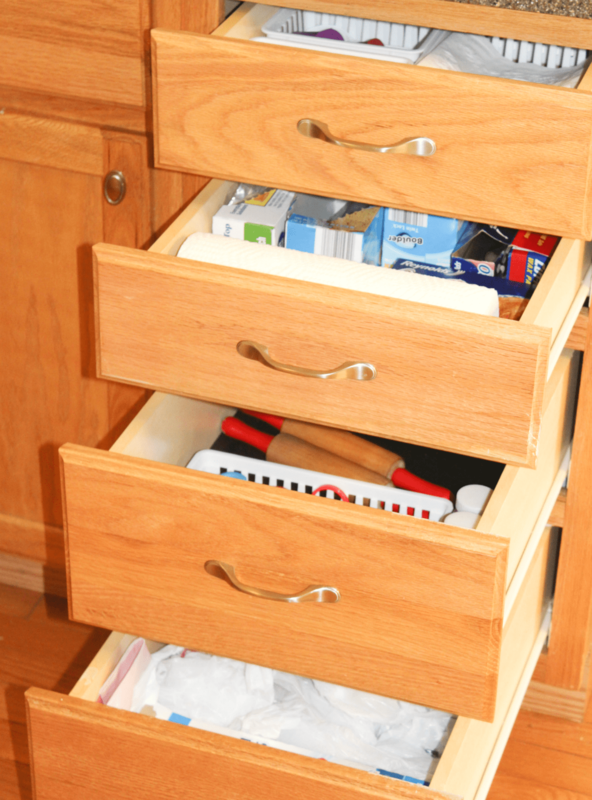 It helps having them already sorted out and kept in this drawer. When it’s all done, I’ll refill it with whatever snacks we have on hand. What can I say other than that I function better when spaces are organized. I get too frazzled, not knowing what I’m about I feel like (we) I am working for the kitchen instead of making it work for us. 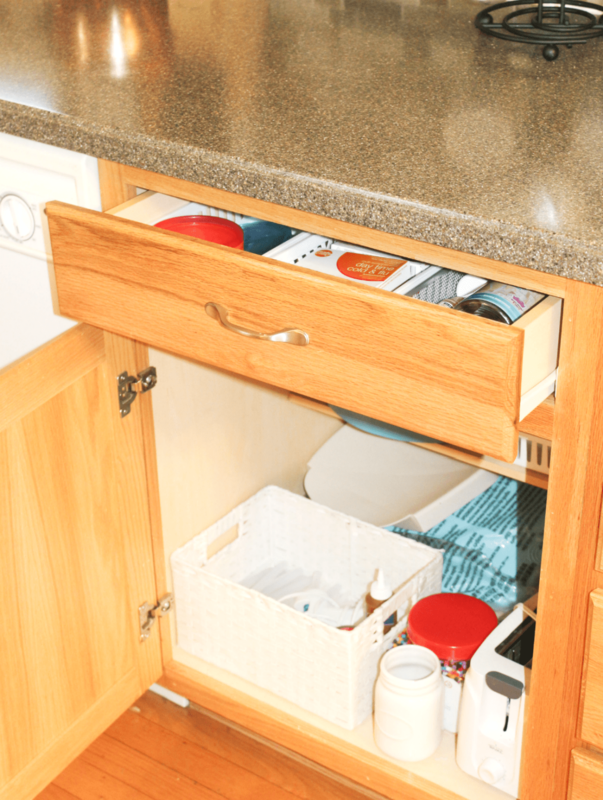 Want to organize your kitchen drawers and cabinets in a way that works for you? 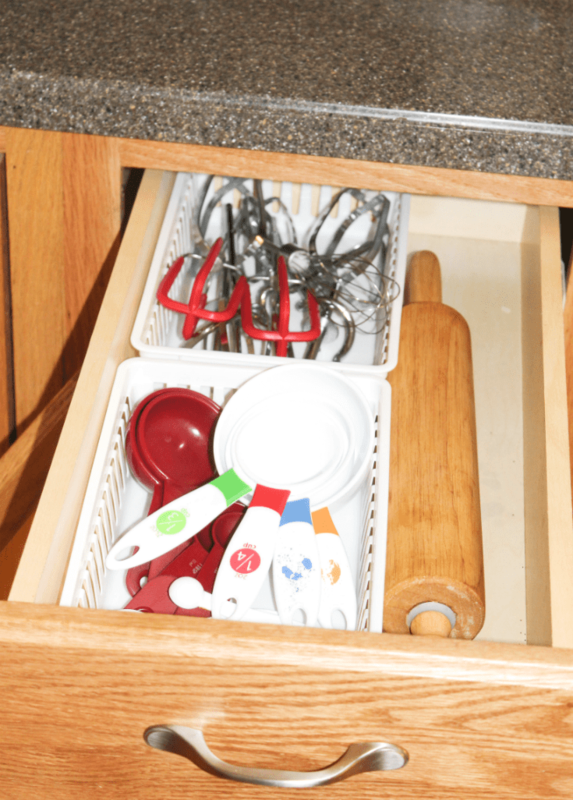 Here are some of my favorite tools to corral utensils and other items to get that kitchen organized. 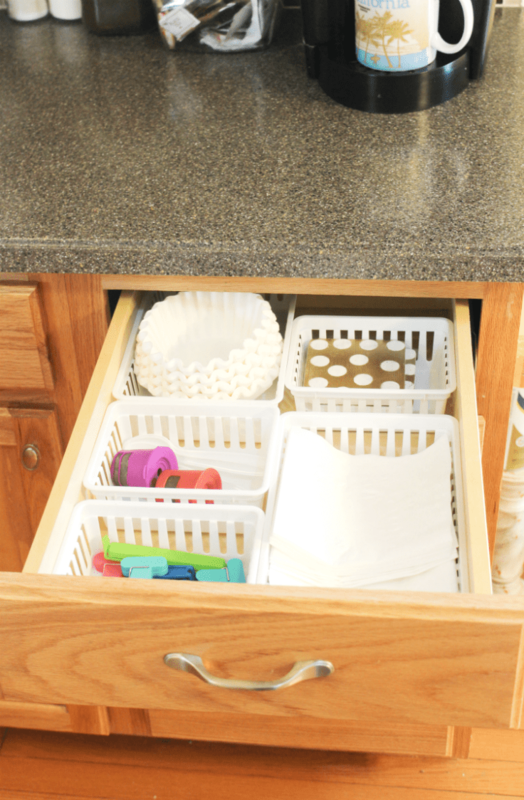 Do you have some kind of organized kitchen system? Or are things all over the place and you are hoping to get to it? I’d love to know your thoughts!! Affiliates links were used in this post. If any purchases are made by clicking on these links, I’ll get a very small compensation at no additional cost to you. Featured on Wayfair – Main Bathroom Makeover!! Great ideas. I just moved into a new townhouse and I am not well organized. I am going to pin your post to pinterest so I can come back to it and implement some of you tips. Thanks! So glad I could help Kathiey!! Thanks for pinning. Congrats on the move – hope you enjoy your new home! Great post! I am a kitchen designer so this post speaks to my soul 🙂 <3 Great use of space and organization! This was so inspiring! I need to go tackle my kitchen! 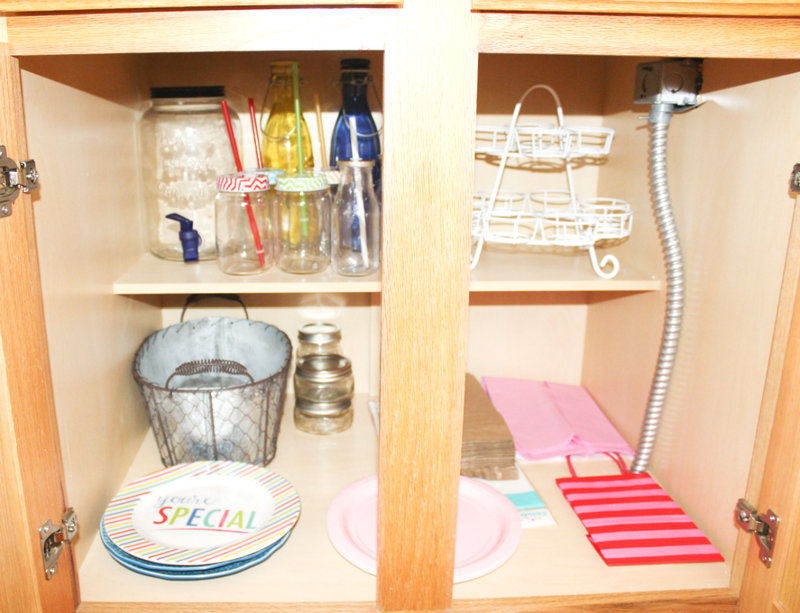 When we had our kitchen redone I organized my cabinets but just a few months later it is all a mess again! Looks like it is time for me to do some organizing! It sure does takes some consistency to keep it organized – like putting things back into place once we take them out. Hope you can find some time to reorganize!! 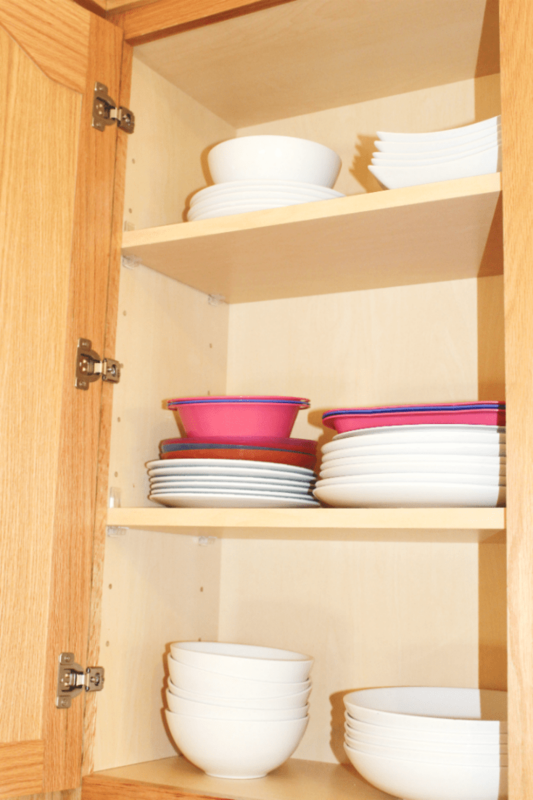 you have so many cupboards and drawers! I can’t believe how tidy they are 🙂 I started folding my plastic bags into little triangles so they fit into a little rack, that’s my top tip :p your kitchen looks fab! They are a lot – some are empty. But I was the determined to get the filled ones organized. That has been so helpful with keeping things in place. 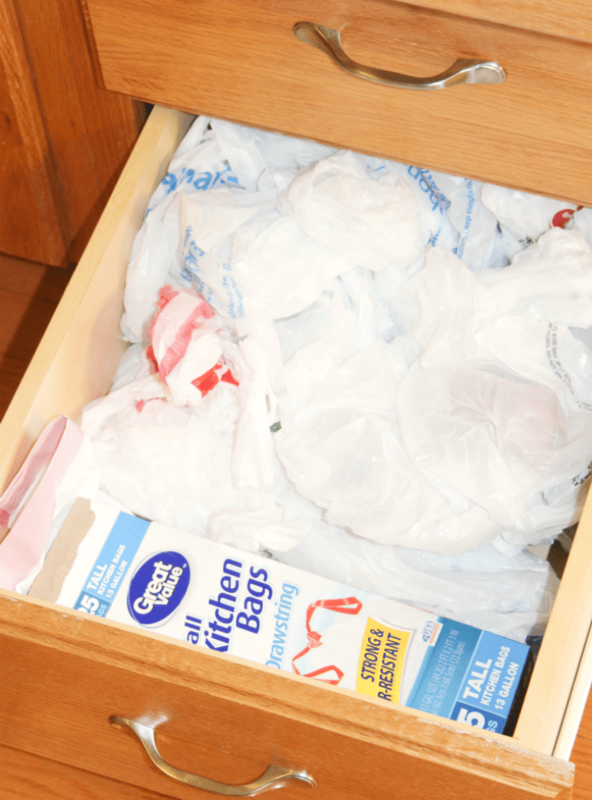 As far as the plastic bags, love that you found something for them. It could get really crazy without a proper system. 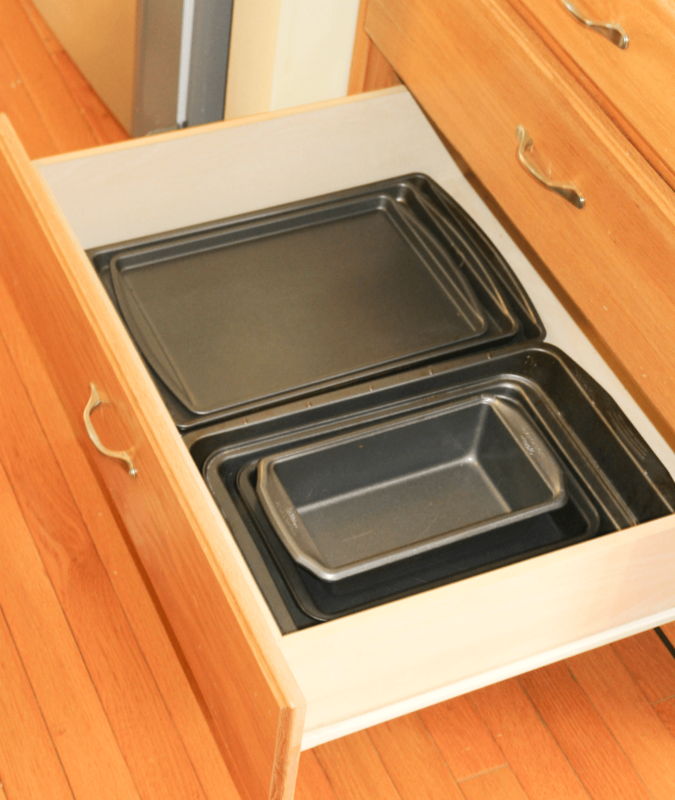 Mine is definitely not – but the drawer is just extra. You are welcome Jamie. 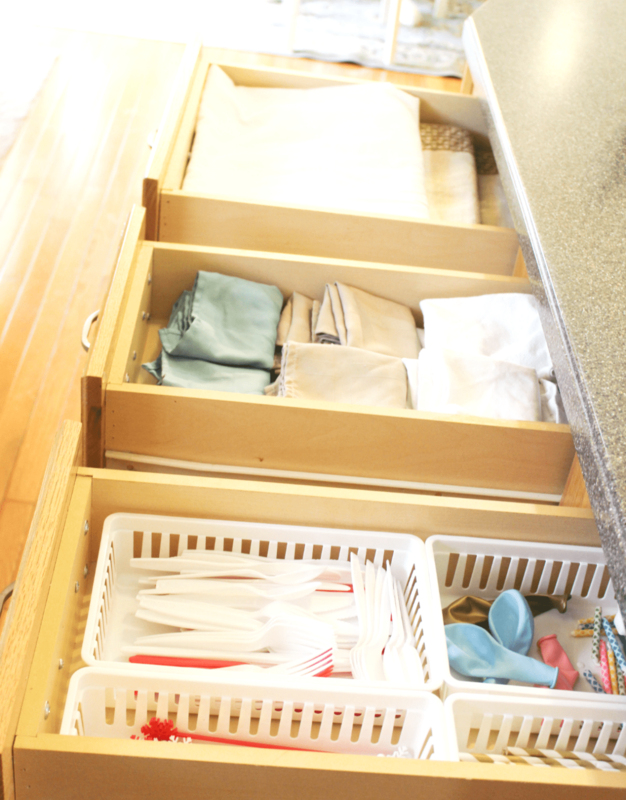 Having the kitchen organized is very helpful!! Ha, so happy it made you smile. 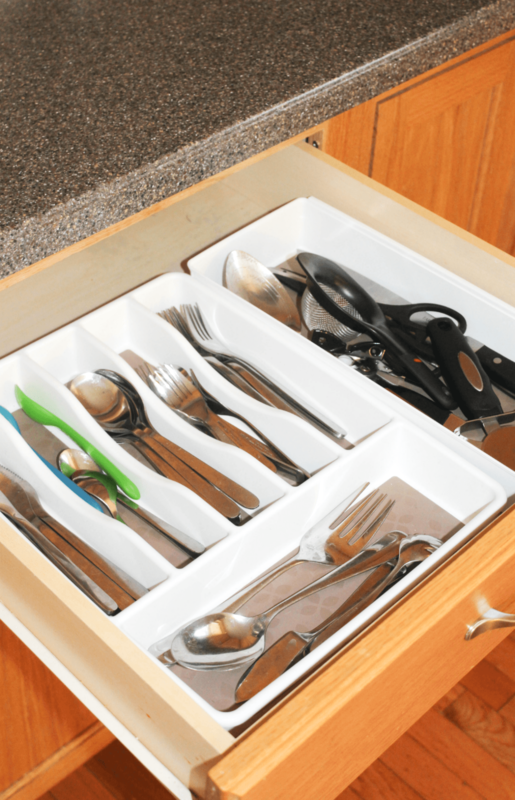 I am big on organization too – it really helps make the home function better. Sure, no prob. Hope you get it done quickly – it can definitely take a while to figure it out. You have such an organised kitchen! 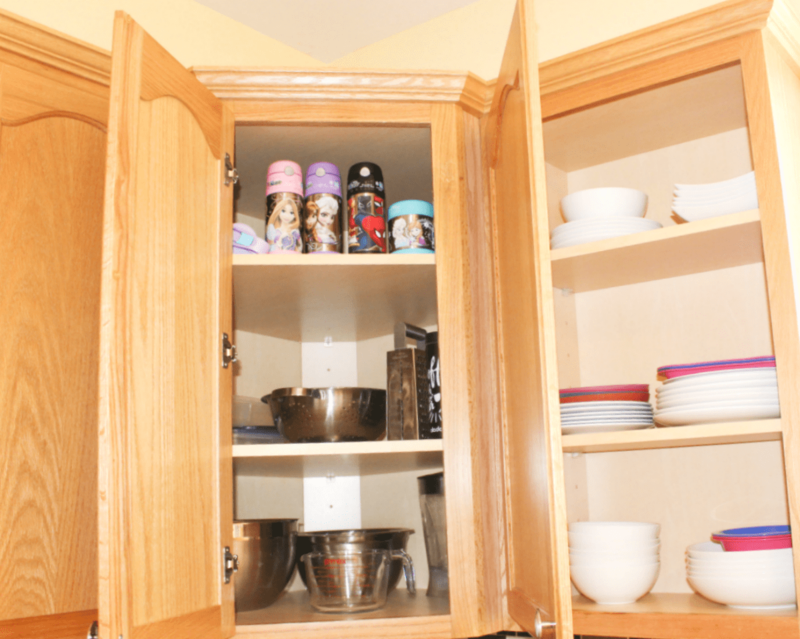 I’m renting a house at the moment and even though I loved the kitchen at first sight, once I actually opened all the cabinets I was a bit shocked at the lack of space.. 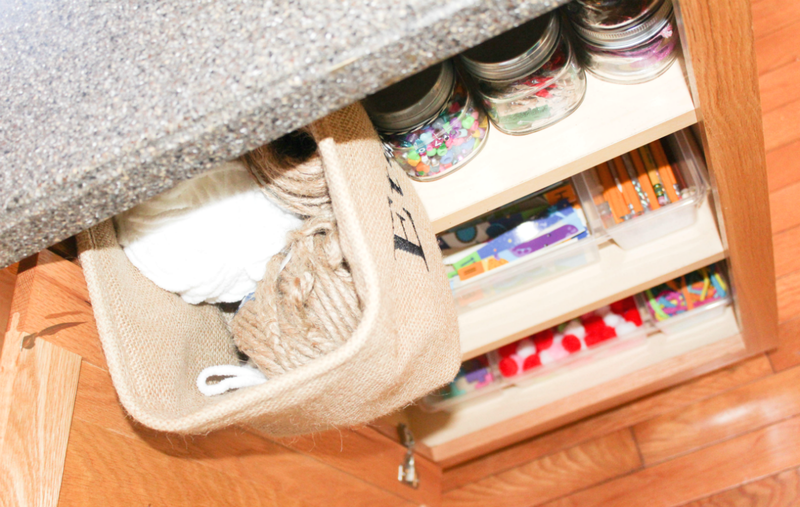 I definitely need to get my hands on some boxes/basket/jars to put in the cupboards to make it more organised! 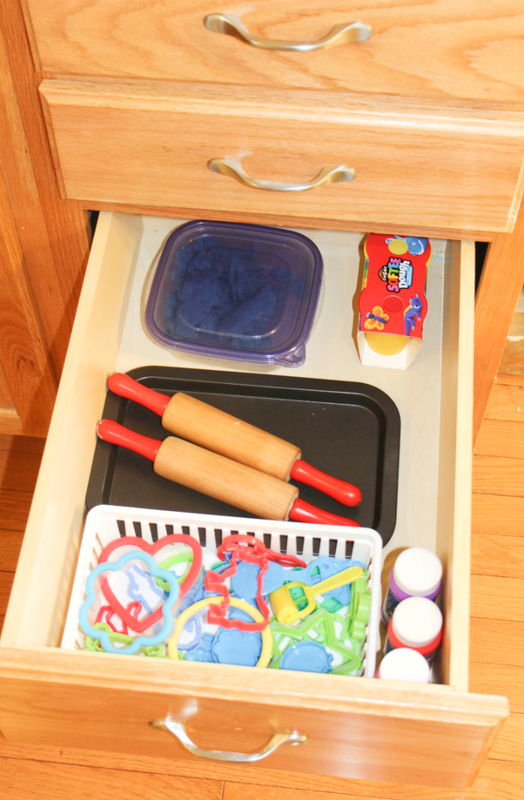 When the cupboards & drawers are small, you kind of have to get creative. 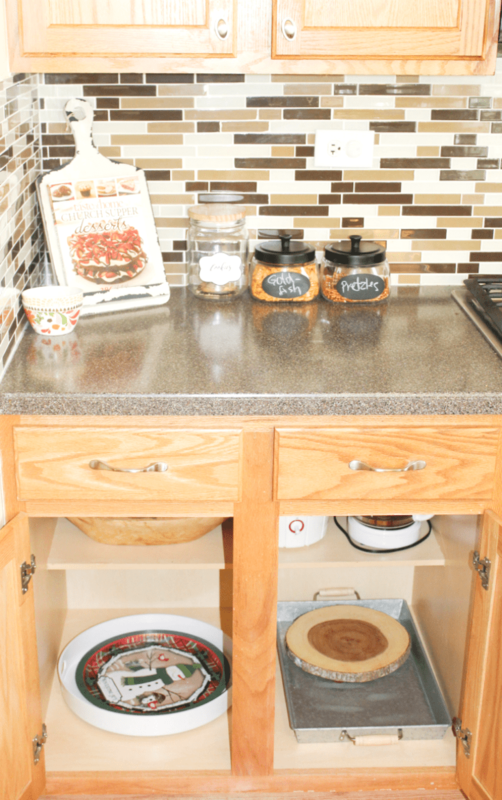 I agree that using baskets and jars will help you corral some of the kitchen things. Happy Organizing, Tine!! 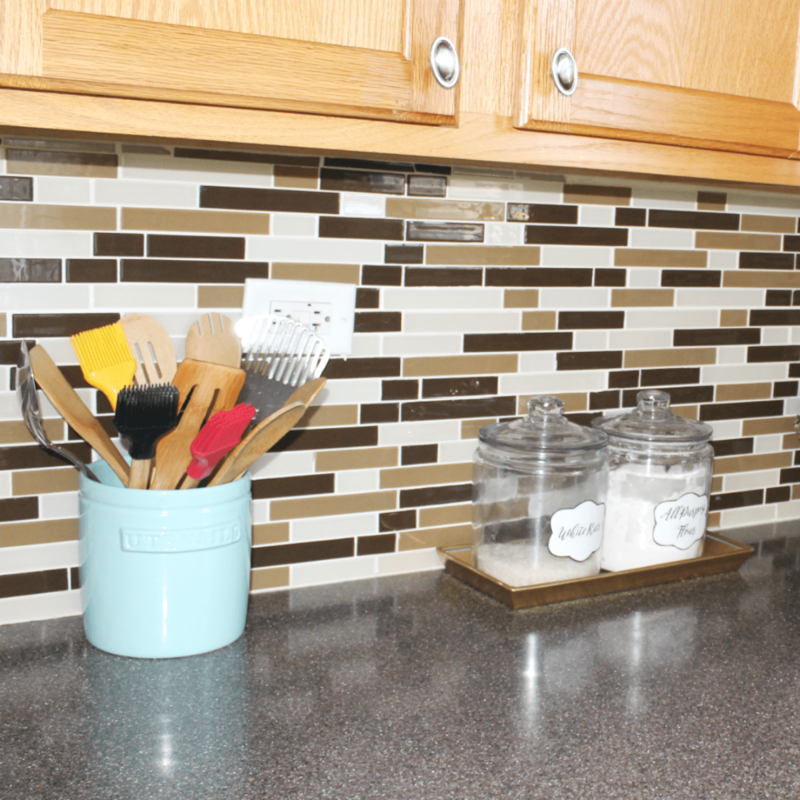 I totally need to do this to my kitchen soon! 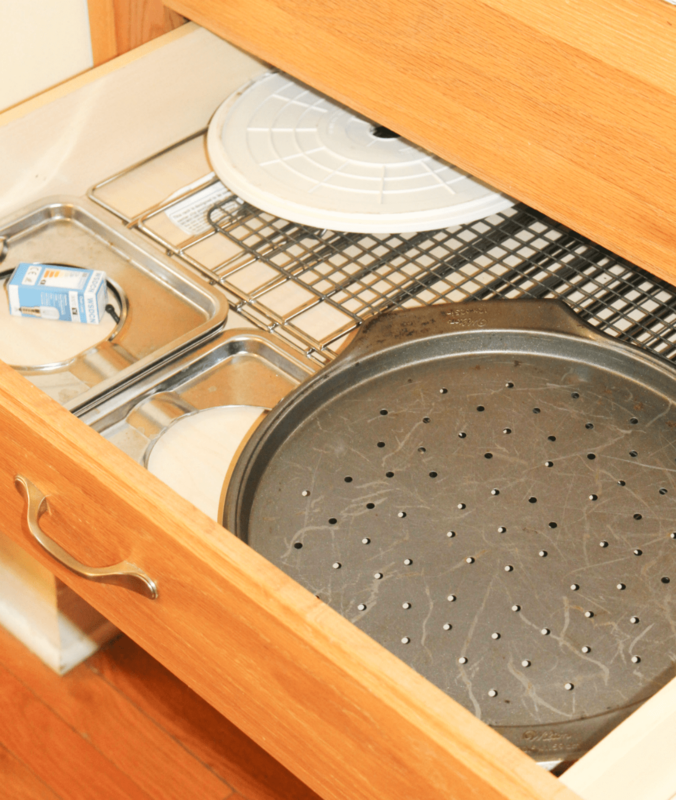 I wish I was as organized as you…Everything looks immaculate! 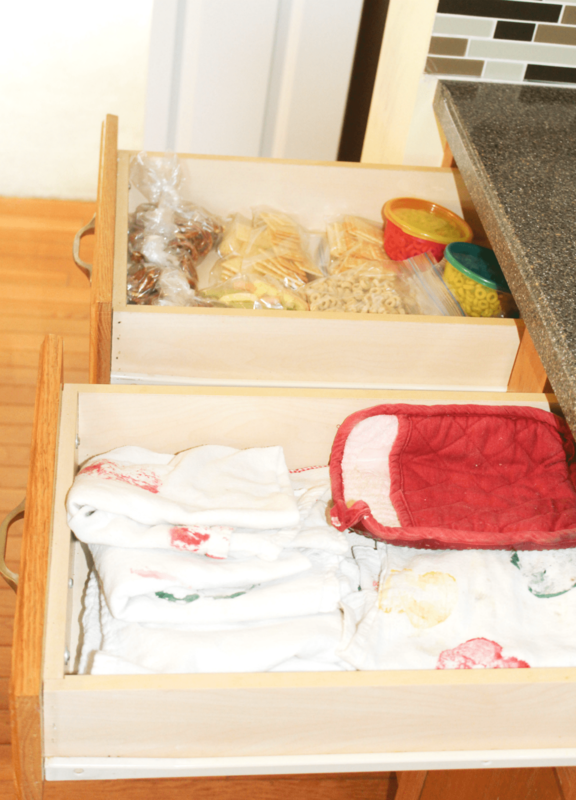 Thank you Joscelyn – I totally work much better in an organized kitchen!! Hope you get to organize yours soon!